The Clinton Foundation is operating a $20 million private equity firm in Colombia, raising concerns from government and consumer watchdog groups who say the practice is unusual and could pose a significant conflict of interest. The Bogota-based company, Fondo Acceso, could also lead to uncomfortable questions for Hillary Clinton as she criticizes the private equity industry on the campaign trail. Fondo Acceso was founded by Bill Clinton, Mexican billionaire Carlos Slim, and mining magnate Frank Giustra in 2010, financed with a $20 million joint contribution from the Clinton Foundation’s Clinton-Giustra Sustainable Growth Initiative and the SLIM Foundation. According to the firm’s Spanish-language website, Fondo Acceso is "a Private Equity Fund that seeks investment opportunities in the small and medium Colombian compan[ies] with the purpose of obtaining economic and social returns." However, the line between the firm and the Clinton’s nonprofit world is hazy. 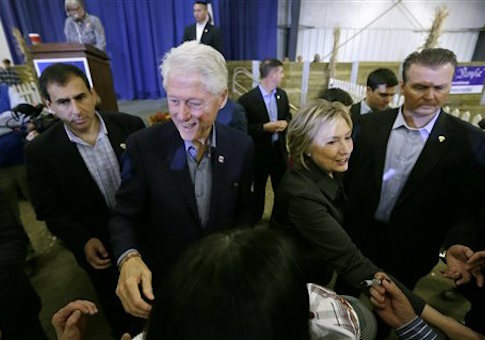 Fondo Acceso is run out of the Clinton Foundation’s Bogota office and staffed by foundation employees, a representative at the office told the Washington Free Beacon on Tuesday. The firm is managed by Carolina Botero, who is also chief financial officer at the Clinton-Giustra Enterprise Partnership. It lists various Clinton Foundation and CGEP officials as directors in its corporate filings. The Clinton Foundation’s tax returns list Fondo Acceso as a related corporation in which the foundation holds a 50 percent stake. Colombian companies that want to apply for venture funding from the Fondo Acceso must also sign a contract turning over financial and internal information to both the private equity firm and the Clinton Foundation. "The Company acknowledges that this letter of authorization or consent is given for the benefit of the FUND and of the CLINTON FOUNDATION and, therefore, cannot be repealed, or the authorization contained herein altered or modified, without the prior and written consent of the FUND and/or the CLINTON FOUNDATION," says the contract on the Acceso website. Fondo Acceso’s financial entanglements are also unclear. Vanessa Jimenez, chief administrator at the Clinton Foundation’s Bogota office, answered the phone number listed for the private equity fund on Tuesday. She said she was not allowed to talk about Fondo Acceso’s investments. Jimenez said Fondo Acceso was based out of the office, but employees there technically worked for the Clinton Foundation. "[Fondo Acceso] does not have any employees," she said. "Nobody is hired by Acceso. … In Colombia, we work for the company, but only the Clinton Foundation is our employer." Jimenez directed questions to Fondo Acceso’s legal representative Monica Varela, who is also a Clinton Foundation official. Varela did not respond to request for comment. Fondo Acceso director Christy Louth, who is also an official at the Clinton-Giustra Enterprise Partnership, declined to comment and directed questions to the partnership’s press office. A spokesperson for the Clinton Foundation also directed questions to the CGEP. CGEP is a Canadian organization founded by Clinton and Giustra. The group contracts its economic development projects to the Clinton Foundation and does not disclose its donors. The CGEP press office declined to provide the Free Beacon with a full list of companies that Fondo Acceso has invested in. The group has been more willing to discuss some of Fondo Acceso’s projects privately and in the Colombian media. Fondo Acceso managerBotero laid out the company’s strategy in July 2012 and disclosed some of its investments in a presentation to the Cartagena Chamber of Commerce. The presentation said Fondo Acceso was looking to invest in local companies in the agriculture, production, and labor industries with "high growth potential" that had annual sales between $500,000 and $10 million. In exchange for financing, the firm would become a shareholder in the companies. According to the presentation, Fondo Acceso’s portfolio included at least two companies at the time. It gave $1.5 million to a Barranquilla-based fruit pulping company Alimentos SAS in 2011 and $250,000 to the Bogota-based telecom company Fontel in 2012, in exchange for shareholding agreements. These investments are a small fraction of the $20 million that Clinton, Giustra, and Slim committed to Fondo Acceso in 2010, and it is unclear where the rest of the money has gone. The Clinton-Giustra Enterprise Partnership press office said Fondo Acceso has invested in various CGEP "enterprises" in Latin America, which are companies founded and co-owned by CGEP and the Clinton Foundation. The lack of clear disclosure raises questions about Fondo Acceso’s transparency, according to watchdog groups. A charitable foundation running a private equity fund is "not something one hears about commonly" and is "very concerning," according to Craig Holman, the government affairs lobbyist at the watchdog group Public Citizen. "Private equity firms invest and take over various companies as social services for a period of time and its intent and its purpose is to provide a reasonable return for shareholders," said Holman. "If you’ve got a tax-free foundation getting involved in running a private equity firm, I just find that very troubling." Ken Boehm, chairman of the National Legal and Policy Center, a government watchdog group, said the lack of transparency was a troubling. He said the public has a right to know whether any of Fondo Acceso’s companies received U.S. government support while Hillary Clinton was secretary of state. "At the minimum, the Clinton Foundation should disclose every company that received investment funds from them, because the public is entitled to know whether those companies benefited from any State Department foreign aid programs," said Boehm.